As THE SUN rises out of the sea to bring the light of another day to Marshfield, it casts shadows over the hills and valleys of a landscape that has known such mornings for many thousands of years. After the final glacier retreated, there was the era of the caribou herds. Then the Eastern Woodland Algonquins came and built their summer shelters by the sea and the rivers, fished along the shore, and raised their crops of maize. They developed a network of woodland footpaths and landmarks known only to themselves. Europeans first came to America to fish the coastal waters and trade their worldly goods for highly valued furs brought down the rivers by the Native Americans. As European wars increased and timber supplies decreased, the English, French, and Spanish began looking westward from Europe to new horizons. They traveled with the rising sun and found, not gold or riches, but woodlands filled with timber for ships and waters with a wealth of fish. In time, Plymouth Plantation was established, and soon the settlers looked about for outlying farm land. One of the places they found was Marshfield. Geography greatly influenced the settlement pattern of Marshfield. Easily reached by water within the sweep of the bay of Plymouth and Duxbury, the southern lowlands and river valleys drew the first tide of settlers. The fertile valley of the tidal Green Harbor River offered some of the richest farm lands to be found in Plymouth Colony. Settlement spread northward to take advantage of the broad valleys of the North and South rivers, with their salt meadows and easy access to the sea at the old river mouth, where Rexhame beach is today. The South River, with its major tributary the Furnace Brook, provided water power for the first Marshfield gristmill built at what is today the Veterans' Memorial Park. Later this convenient water-power site was used for a saw mill and a cotton mill. Deposits of bog iron in the Furnace Brook valley attracted men to operate an iron furnace. The North River, biggest of Marshfield's three rivers, provided a major passageway along the northern border of the town. The surrounding uplands and hills produced the great stands of white pine and hard white oak necessary for a thriving shipbuilding industry. Soon shipyards sprang up along the upland areas adjacent to the river. Mills were established on the brooks that flowed into the river. The families at the north end of the town took advantage of the fertile fields along the river's edge for farming and cut the salt hay on the river meadows for cattle feed. For the first comers, Marshfield began in metes and bounds, rods and degrees. These were the measurements by which the land was laid out and granted by the Plymouth Colony Court and later by the proprietors of the town, after its founding in 1640. The settled area of the town grew as land was granted, piece by piece, with each grantee getting some tillage, pasturage, wood lot, and salt hay meadow. Each separate part of Marshfield began to develop its own distinct character, and the town became a collection of dispersed villages. It is these villages, each different and identifiable to this day, that are the principal subject of this narrative. The families who settled these villages, and the people who followed in their footsteps, are the cast for our story of Marshfield. The settlers cleared and tilled the land, built homes, mills, and churches. They all by necessity were farmers, and some were also fishermen, millers, shipbuilders, store owners, blacksmiths, and cobblers. Over the years, as the town became more populated and complex, other people took their places and pursued other occupations and activities. Indeed, the people of Marshfield have guided her destiny to the present time. We who live here today are a part of a continuing story, a story started even before the first settlers. There have been several turning points in Marshfield history, when the course of events has been dramatically changed. These include the arrival of the settlers, the departure of the Loyalists after the American Revolution, the coming of the railroad, and the extension of the present Route 3 to the town's doorstep. The story of Marshfield cannot be understood without recognizing these pivotal moments in the course of events. As we celebrate Marshfield's 350th birthday, we look back at what has been our past and forward to what shall be our future. We hope that this narrative history of Marshfield will excite the reader about the story of what has happened here and inspire the people of the town with pride in out heritage and faith in our future. 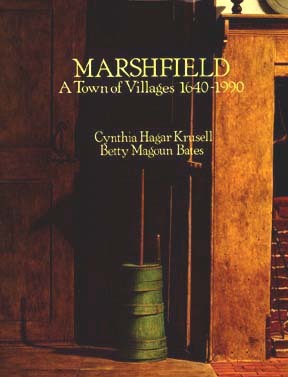 Marshfield A Town of Villages 1640 - 1990, is available at local bookstores, including Jackansons in downtown Marshfield.